Finding joy in everyday life! 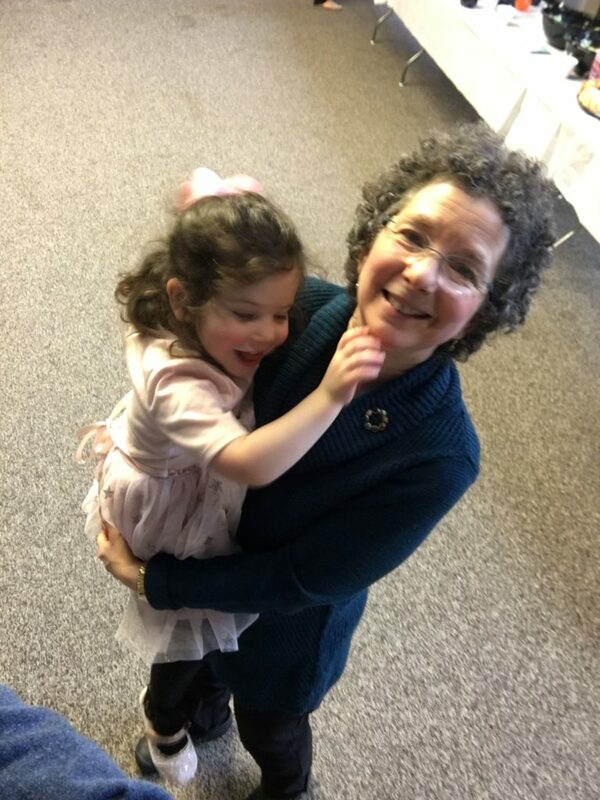 Denise with grandchild #3. I do understand how difficult it is to keep a happy face on this when you are so frightened. Eventually, you will feel confidence in yourself and in your health, and you won’t feel so frightened. Believe me, you are not alone in having fear of CLL! Here are a few suggestions that have worked for me. 1. Allow yourself to be frightened or upset for only one day at a time, particularly after a blood test that wasn’t what you wanted. 2. Research. The next day, concentrate on the blood marker that concerns you, and start some research on what you can do about it. Look up supplements and herbs. Make a lifestyle change, etc. 3. Have fun! Find time every day to do something you enjoy that is relaxing and gets your mind off of CLL! Read a book, go to a funny movie, visit with a friend (and not talk about CLL) maybe shopping or an art museum or something that you find fun (and gets your mind off the CLL). 4. Find your own personal meditation. I’ve tried meditation tapes (now they would be CDs or better yet, mp3s). This wasn’t for me, but many people find relief in this. My personal meditation is reading novels or writing, or even drawing. I have sketch books, and I find that when I’m sketching, I’m not thinking of anything but the pencil and sketchbook. I lose track of time. It is wonderful! Think back to childhood and what you enjoyed doing that made you lose track of time. Give yourself a gift of figuring this out, and then act on it! 5. Get a good night’s sleep. Make your bedroom light-proof so you can get a good sleep at night and make your own melatonin. Nothing makes you feel better than a good night’s sleep! 6. A new watchword: you are NOT about to explode! Any doctor that would see you today would send you home and then go about his or her business. You are not in imminent danger! Enjoy today! None of us know if there is a tomorrow (we get hit by the bus, etc., who knows?) So why waste today? Enjoy it! It is a gift you are squandering on worry. 7. Recognize that you can gain control of your health. It wasn’t until I became Macrobiotic (ironically, I am no longer macrobiotic, but still…) that I started to see the control I could exert over my CLL diagnosis. After one month of giving up all processed foods back in 2005, my WBC dropped back to 14, where it had been at diagnosis. 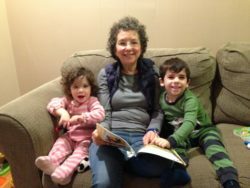 While I’ve moved on from Macrobiotics, the lesson learned was that I COULD get control of this CLL thing. Since then, I’ve also learned that healing is all about the gut, the digestive system. Work on your digestion and you are working on your health! I’ve not been able to get to where my blood work indicates I’m CLL-free, but I am back in stage zero. 8. Seek out a therapist. If all of this leaves you worried still, see if you can find a therapist. There is nothing to be ashamed of about this. You are facing down your mortality, and we don’t like to do that. It is crazy-making. Back in 2003 or maybe 2004, I was constantly crying with worry and wondering how my boys would grow into manhood without me there. I worried about my husband. I cried about never meeting grandchildren. And see, all those tears were a waste of energy. That said, I DID see a therapist at that time, and it really helped me. What I learned from him at that time was that I had to take action. Until that point, I felt like I was a victim; I had this CLL diagnosis and I believed it was too late to do anything about it. Damage was done, and I had to accept my fate. Now THAT was crazy! There was so much I could do, but talking to this therapist helped me see it. If you continue to be depressed, please find someone who might help. If they make you feel worse, find a different therapist. But do try all the other items above, first. PS Writing about your worries here, on the site, really helps others. We’re all in this together! In a recent email one of my CLL buddies wrote and told me about her improvement in neutrophil count She had been taking 600 mg of shitake, four tablets of Maitake-D Fraction, 1950 mg (3 tablets) of Reishi, and two tablets of AHCC. She noted that her neutrophil count went up to a high normal at her next blood test! Great news!!! After this success, she experimented by dropping to a 1/4 of the dosage. Unfortunately, at her next blood test, the neutrophils showed a rapid descent. It was no longer in normal range. This CLL friend of mine wanted my opinion of what to do. Of course, I told her to go back on the dose that worked for her! Not as a doctor (of course) but as a CLL friend. The reason being — and this is so important — we are not curing our CLL by everything we do and all the supplements we take; we are managing it! Let me repeat…it would be wonderful if we all could have a home-made cure. I’ve spoken to three men who feel that they have, in fact, beaten CLL by DIY, home-done efforts. This has NOT been the case for me. I still would be diagnosed today if I had a blood draw for the first time. They would call me in or call me back to give me the hideous news. And yet, here I am, alive and quite well (thank you very much) after 17.5 years at this. Why? Because I am managing the disease, and this is working for me! Now, why do have the photo of mushroom powder on the top of this post? Good question. Because of this CLL friend’s email, I reviewed my own history, my supplement notes in particular. I used to take the Maitake D Fractions, and that was at a time when I was starting to show real improvement. (At that time, my WBC went down over 20 points and for a change my RBC didn’t nosedive along with it. Whew!) I was also cooking low and slow at that time, and I gave that one thing a lot (maybe too much) credit. After I stopped taking the Maitake D Fractions (recommended by one of the CLL healed, no less) I substituted by buying dried shitake mushrooms and grinding it to add to soups and stews. Later (I really don’t know when) I started buying organic mushroom powders, and adding a scoop to my smoothies I have about five days/week. The good health, including normal absolute neutrophil counts, continued, and continue to this day. I mix up the type of mushrooms. The pictured above are just four of the variety that I alternate day by day. If you do a search on each of these mushrooms, along with “CLL” you will see there is evidence that this food (not a medicine) is good for you! It helps people with CLL! The types of mushrooms I take regularly include shitake, maitake, reishi, cordyceps, lion’s mane, and turkey tail. I have no favorites; once they’re mixed in the smoothie I can hardly tell they’re there. Do I recommend that you drop everything else and start taking mushroom powder and that this alone will heal you? Not such a good question this time. The answer is NO! Getting cancer or leukemia is a comprehensive process, and so it healing yourself enough so that you can continue to live a good life. All the other pillars that create health matter: clean food, clean air, clean water, reduced/managed stress, good sleep, meditation, finding joy in life; these are ALL critical, and not something that you will find in your oncologist’s office. Perhaps not even in your alternative practitioners office. We need all our professionals, but to be well you have to count on yourself. What about the Peak Immune? I’ve written about this product before. I am NOT affiliated with this company or any other. This is a non-profit site written only to share and help! I started Peak Immune years ago, at the advice of a Chinese herbalist (himself recommended by an alternative MD I traveled to see in New York.) Peak Immune is an immune modulator. This means that it regulates your immune system to the place it should be. Not ramped too high, and not dropped so low that you are in physical danger. Peak Immune is not a mushroom. I believe it’s rice bran arabica, in this case a food derivitive. I’ve taken Peak Immune for years (cheapest in the States at LuckyVitamins.com, when you buy via autoship). It has been the one thing for certain that has increased my neutrophils. On the literature it says that it “increases the activity of NK (natural killer) cells.” So when I first started taking it, I wasn’t expecting it to increase my neutrophils But it most certainly does. Now, with the mushroom powder, I take only three Peak Immune capsules a day, and I seem to be holding steady. You have to test this for yourself. Once again, this is my experience, along with the stated experience of a woman who wrote me recently. It is not harmful; it is a food. The mushrooms are not inexpensive, and neither is the Peak Immune. You don’t have to buy an arsenal like I do, but change it up, one at a time. And if you do try this, and test your results at your next blood draw, let me know — good or bad — how it works out. Special request: While I do respond to emails, I think it’s kindest of everyone to respond directly on this site, to the pertinent post. This will help people on a search find not only my words, but your concerns, questions, worries, and your own answers and experience as well. I promise you will remain anonymous. It all helps! As a final note, I am still working on my book. I will check in again, not necessarily “soon,” but please know that it is in progress. 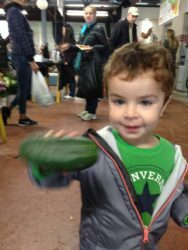 Shopping for a future pickle at our local Farmer’s Market. Last night my husband and I had what we call “fast food” for dinner. Don’t raise your eyebrows; it’s not what you think. I tend to cook an elaborate dinner, in quantity suitable for leftovers, about three times a week. After that, we either eat leftovers combined with freshly steamed vegetables or a raw salad, or we make “fast food.” In this case, it was slow-fried eggs, corn on the cob, and steamed brussels sprouts. Why is this fast? Dinner took considerably less than a half hour, and it was delicious! Before I get into recipes or cooking techniques (like what is “slow-fried”?) I need to make another point. Success in the kitchen, as measured by truly healthy and nutritious meals and snacks that taste good, require more than kitchen skills. They require shopping! Yes, if you want to beat this CLL thing, and you want to do it naturally, you have to spend some time in the supermarket and, if available, your local farmer’s market. This is another case of failing to plan is planning to fail. You have to shop the stores in your neighborhood until you find the best places for abundant organic fruit and vegetables. Yes, I do eat eggs, chicken, fish, and sometimes even beef, but I still eat a plant-based diet. The animal protein is more of a side dish. Another side note: sometimes your organic produce choice won’t look so good. Sometimes conventional might be a better choice, in which case please soak in 50-50 white vinegar and water to cleanse as much pesticide residue as possible. Another choice to shop more than one market. If the selection at the first isn’t so good, you still have one more chance to get your organics. And where do I buy all my animal protein? This is not an answer set in stone. We still buy eggs from our local farmer’s market. They are consistently better than the organic eggs at any supermarket. The yokes are orange rather than yellow, and they are delicious! In the past my meat sources have been Trader Joe’s, Whole Foods, farmer’s market, other specialty stores. You have to continually be aware and look for the best places. Your local Weston A Price chapter can help you source local good foods. The point is to BE PREPARED. Shop ahead and get the best organic veggies and fruits in season. You can rinse and freeze the fruit. Store the leafy greens and other veggies in a loosely closed plastic bag so that some air can get in. This works for me, and it’s fairly simple. Simple is good. The more complicated you make your food gathering, the more of a task it will seem. Of course, it’s not all about veggies and fruit. Also keep stocked with organic pastured free-range chicken and grass-fed pastured beef, wild caught white fish and salmon, and pastured free-range eggs. An extra freezer is wonderful, if you can afford it. Beyond that are the seasonings and sauces. I’m honestly not the most skilled cook, but I do keep tapioca starch (flour) on hand for mixing with water and seasonings and pouring over a stir fry when almost done. It turns into a delightful gravy reminiscent of a Chinese food dish. Also keep organic, extra-virgin olive oil in the cupboard, along with apple cider vinegar, other vinegars (I love Eden-brand umi-plum…yum!) and balsamic vinegar as well. (all organic, please) A supply of fresh lemon is great to add to dressings and sauces, and also to squeeze into a morning glass of water for your alkalinity and digestion. In another post soon, I will write about some of my favorite cooking techniques. Not only should your vegetables be organic and fresh, and your animal protein free-range, organic and pastured, but nothing should be over cooked at temperatures above 300-degrees Fahrenheit. This is a challenge I’ve managed to overcome by checking out advice on Google and youtube, and by experimenting on my own. I am happy to share and will do so soon. In the meantime, get out to your local market and start checking out the best sources and prices. You’re in this for the long haul. As environmental doctor Sherry Rogers wrote, “The Cure is in the Kitchen.” I would add, in order for that to happen you have to get to your grocery store first! PS A good cancer cookbook is The Cancer Fighting Kitchen. There is an earlier addition at a greatly reduced cost on Amazon. Living well with CLL! The author (in red) and some of the family, 4th of July 2018. Please notice that the name of this article is not ‘what’ to eat, but how. We all think we know how to eat. After all, we’ve been doing this since birth. But sometimes we need a reminder. Let’s start with a scientific fact. Our immune system is strongly related to our gut, also known as our digestive system. Of course, it matters what you put into that system, that is more than true. But as someone who has struggled with digestive problems pretty much her whole life (at least as much of it that I can recall), there is much more to it than the food. The first thing I noticed was how the residents were skeletal thin. And many were missing teeth, which was concerning. But I was fighting leukemia here, and if I had to get thin and lose a few teeth in the process, well, that would be the breaks. As it turns out, I did suffer some gum recession and was about twenty pounds thinner than I am these days, but still it was absolutely worth the experience. I learned so much. One of the first things I learned was to chew my food thoroughly. To count how many times you chewed, chewing until the food in your mouth was liquid — or as close to liquid as possible. To me, this sounded disgusting. But honestly, there is wisdom in this practice. The more work you consciously put into chewing, the less work your digestive system has in order to process your intake each day. When you chew, saliva mixes with your mouthful, adding digestive enzymes to the mix. Yes, those pills you buy in little bottles are naturally available if you just chew, chew, chew. I’ve recently gone through a spate of serious stomach aches. I’m talking abdominal pain for a 36 hour stretch. Go to bed with a stomach ache and wake up with the same dull ache emanating somewhere from the left side of my waistline and radiating out to other regions of the digestive tract. I felt hunger but was afraid to eat. My husband was out of town on a business trip. I took to the Internet and looked up stomach pain and CLL, learned that it could be related. Of course, this led to a night of insomnia, keeping me from healing. I’m a strong person, but I sometimes also feel the fear. But please take note that my main suggestion here is to chew your food well. Sit down when you eat and focus on enjoying your meal. Put a reasonably-sized helping of whatever you’re eating on your plate. Take a look at your plate before you eat and see if you agree that this is enough. Would you think it was enough if you were in a restaurant? That is your clue. Taking seconds will overload your gut and overwork your digestive system. When your digestive system is free from processing that food you put in there, it can work on making you healthy. That’s what IF/intermittent fasting is all about. But that, too, is another article. Just be sure to concentrate on eating while you’re eating. We tend to gulp food while walking around. I’m the worst while I’m cooking, and I’ve resolved not to do that any longer. So eat slowly and mindfully. Put down your fork between bites. Breathe. So be well, enjoy your food. Eat hearty (but don’t overeat! ), and chew, chew, chew! Wishing you peace and the best of health! I made a series of videos with Teresa, a CLL buddy I met through this site — and who was visiting the state for her son’s graduation. This is the first of what will be many videos from this meeting. I hope you get some good information from it. It took me some time to figure out the iMovie software. It turns out that it’s easiest to edit and create the video on my iphone — and also to upload it to youtube the same way. Another (funny) fact…the best how-to videos about how to make DIY movies are on youtube and made by kids! CLL Bad Blood Test: Now What? Reading time with Naomi and Moshe. Life is good! A young woman in her mid-forties wrote me recently to say how sad and fearful she was because, despite her efforts, her white blood count and lymphocyte count went up. My answer to her was comprehensive, so I am sharing it now in this post. I truly understand about how you feel anxious, scared and nervous. I’ve been there, and honestly, some times I get nervous when I see a new bruise (could be low platelets) or if I look pale (anemia), and so on. However, I’m looking at your numbers, and I can tell you that although they did go up (in the wrong direction), you are still at a very safe place. I wonder if the doctor was alarmed…did he or she suggest that you come in again soon? Or that it looks like you will need treatment of some kind? I doubt it, although some doctors are too quick to prescribe treatment, in my opinion. And…here’s the important part: at some point I learned that if my doctor wasn’t sounding alarm bells, then I just wasn’t going to get nervous either. What I also learned was to take a day (maybe two) to allow myself to be upset and depressed. Then it was time to do research and find ways to improve the blood test scores. So you’re on the right track by writing me. (Although by no means should I be your only source of answers.) Check each of your markers and do a Internet search. There are many examples below. CLL WBC natural treatment.I just did this search and came up with this page: http://naturalhomeremedies.co/CLL.html. There are many others. Start searching for this in as many ways as you can come up with the right keywords. I have a friend who is a very conventional doctor.She explained to me that when doctors have no way to cure an illness (think of a cold virus here), they “aggressively treat the symptoms.” I’ve tried to apply this to the different blood markers that we test when we have CLL. You asked about your WBC and your absolute lymphocyte count and percentage. I see from what you wrote that you are eating organic and being careful of what you eat, even when traveling. That’s wonderful! Please keep it up! The next question is: do you cook “low and slow”? This means at low temperature for a longer time, making certain never to burn or totally dry our your food. If you’ve been grilling or overcooking food, this is a place you can make an improvement. Eat bone broth soup and fermented veggies. This is more advanced, as in not what people will start to do the moment they decide to take control. However, learning to make your own fermented vegetables provides probiotics that far exceed the numbers in those pills we buy online or in the health food stores! See this article: http://darwinian-medicine.com/ask-eirik-how-many-bacteria-are-there-in-sauerkraut/. And at least three alternative doctors/practitioners told me personally to have bone broth soup specifically for leukemia. These are both healing foods. The Weston Price Foundation is all about both these foods. They have local chapters that teach classes on how to make your own sauerkraut and other veggies, and also how to make bone broth soup. Other ways to get well. Are you getting enough sleep? Are you avoiding toxins? Are you taking Peak Immune by Daiwa? (check out LuckyVitamins.com, for the best deal.) I have a comprehensive list of what to do in this article: http://www.cllalternatives.com/2017/11/cll-diagnosis-15-natural-things-to-do/. Please read and re-read this. Getting well is a process. It’s good to revisit things you know you should do, that you haven’t gotten to yet. Remember that the C in CLL is for Chronic. Generally, this is a slow-moving illness, giving us time to work on our wellness. An important part of getting well is to think of yourself as well, and to expect to be here for the long haul. Visualize yourself in your eighties. Think of what life will be like then. I know it’s really hard to conquer the fear, but there is joy and life on the other side! I remember when I first became Macrobiotic in 2005. That is what helped me conquer the fear. At that time, my WBC had jumped into the 20s, so like you, I felt the end was near. It wasn’t! But early July, it will be 17 years and counting. If it’s like this for me, it can be like this for you, too. Hang in there, and allow yourself some happy thoughts. Do something fun and get away from it for a while, and then double down with one or two new things to add to your wellness plan.